This type of environment really allowed us to showcase not only our most popular models, but our fair pricing policy, our comfortable no-pressure approach and, as a bonus, the tablets we showcased are similar to the tablets we give each new trailer owner. 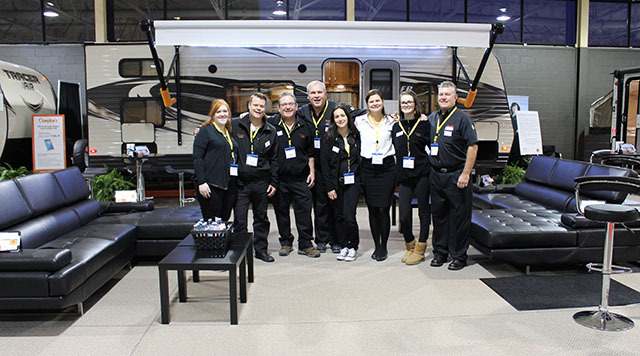 There has never been a Canadian RV dealer approach a show like this before, and in the continued spirit of Campkin’s, pushing the digital envelope, customers and sales staff alike rated the experience a success. The logic behind the strategy makes a lot of sense; bring 7 or 8 of your most popular floorplans, post the prices with big red numbers, let people walk around at their own pace, and of course provide dozens of brand new Galaxy tablets preloaded with the Campkin’s App. Providing customers with the means to shop and compare prices online, in such a comfortable environment, showed visitors that the Campkin’s pricing policy is fair and the buying experience principled. Roland, the Owner and General Manager, negotiated a series of bulk buys from the manufacturer, enabling him to sell their top models at unbeatable prices, and those most popular floorplans were the ones on display. Throughout the weekend customers were seen pulling up other dealer websites and comparing prices, exhibiting keen buyer awareness and sophistication. Ninety percent of all purchases nowadays are first researched online, and so by giving their customers a comfortable place to sit, access to an RV Advisor, tablets and internet connectivity, and an app designed to showcase their entire inventory, they showed a confidence in their business model that is rare in this industry. With the Campkin’s App on each tablet, the public could view over 200 trailers on the Campkin’s lot in Whitby, each with plenty of images, prices, features and options, and each one has a video walkthrough. At any time during a customer’s tablet session, they could signal an RV Advisor and ask questions about a unit, ask for assistance in finding floorplans with other features or inquire about construction, financing, custom orders, etc. And with visitors at various points in the buying cycle the Campkin’s RV Advisors had a comfortable environment to help customers make decisions. “This type of environment,” says Roland “really allowed us to showcase not only our most popular models, but our fair pricing policy, our comfortable no-pressure approach and, as a bonus, the tablets the public were using are similar to the tablets we give each new trailer buyer.” As part of the Campkin’s buying experience each trailer comes with a new Galaxy tablet loaded with helpful apps from the Campkin’s App to the RV Care App, campsite apps, sani-dump locations, GPS location apps, RV checklists, and so much more. Probably the most valuable documentation loaded on these tablets is the owner’s manual for the specific trailer they come with, warranty and maintenance documentation, manuals for each and every appliance and electronic device on board, and anything else that can be included from the manufacturer. Essentially these tablets come preloaded with a helpful set of RVing apps as well as all the digital paperwork one would ever need for a new trailer purchase. Campkin’s will again be showcasing these tablets at the RV Internet Lounge this coming weekend at the Toronto Spring Camping & RV Show & Sale from February 25th to 28th. They will also have many more of their most popular Prime Time brands and models on display. 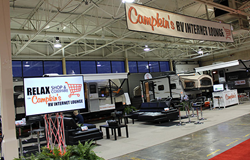 Always an early adopter, the Campkin’s brand has a history of experimenting with internet marketing trends and advertising best practices in an effort to present an honest and fair profile for RV enthusiasts across Ontario. “Our policy is transparency in pricing, the presentation of rich media so the customer can make their own decisions without the need for a salesperson and, of course, great customer service after the sale” says Roland, the owner and President of Campkin’s RV Centre.